Ok, so last weekend I held a Stamp a Stack card making class with a lovely group of ladies. We had a very special afternoon tea before the class commenced. I pulled out all the vintage teacups & saucers & side plates (Proper Shelly china all the way from England, very fancy). We feasted on scones with jam & cream, coconut drops & Monte Carlo’s with pots of tea resplendent in their tea cosie’s on a table covered with an antique lace tablecloth. Of course as it was a Saturday afternoon & the following day was Mother’s Day (here in Australia) I also treated the ladies to a glass of something pink & fizzy before we commenced with the card making. Unfortunately a couple of the ladies who had booked in couldn’t make it at the last minute & missed out on the afternoon tea & get together. They don’t miss out entirely though as they will still receive their card kits (minus the stamping) via the mail. As I needed to type up the “How To” to go with their kits I thought why not share it with all of you?! And so as an extended Mother’s Day present to all of you, I’m going to provide you with not only the “How To” but also a product list so that you can recreate these cards for yourself. A quick note, some of the items used are retiring on May 31st 2016. If you’d like to purchase them please make sure to place an order before they go. Look out for special links to help you with getting these must haves before time runs out. 2 x Sahara Sand Card Bases, cut, scored & folded. Various Stamp Blocks to adhere Photopolymer or clear mount stamps to. 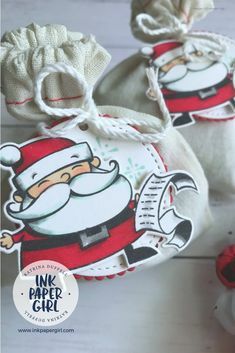 Step 2: Wipe some off some of the ink using a baby wipe or tissue so that you only have ink covering the middle of the stamp & a little bit top & bottom. Of course you can skip this & just use the stamp fully inked to cover the entire background. Step 3: Take both of your Sahara Sand card bases & stamp them with the Hardwood background stamp. Step 4: Ink up the car image from the Guy Greeting stamp set using some Memento Tuxedo Black ink. Step 5: Take the larger of the two pieces of Very Vanilla cardstock & stamp it with the car image from the Guy Greetings Stamp set. Step 6: Take the remaining piece of Very Vanilla cardstock & stamp it with the tool image from the Guy Greetings stamp set, again use the Memento Tuxedo Black ink pad to apply the ink to your stamp. Step 7: Glue your stamped Very Vanilla cardstock to the Basic Black cardstock. Again these are two different sizes so make sure you match them up correctly before gluing. You should have a 0.5cm border of Basic Black around the outside of the Very Vanilla. Step 8: Glue a piece of the Typeset DSP to each of the card bases. The positioning can either be like mine or you could chose to move it around a bit to suit yourself. Step 9: Stamp your sentiment onto each card base. I chose “To A Classic” for the car, & “Righty Tighty, Lefty Loosey” for the tools. Both of these sentiments are part of the Guy Greetings stamp set. As a note, I stamped “To A Classic” in Early Espresso & “Righty Tighty, Lefty Loosey” in Memento Tuxedo Black. You can use both or one or the other it’s totally up to you. As you can see from my photo it’s very hard to tell the difference on these cards. Step 10: Glue your layered Basic Black & Very Vanilla pieces onto your card bases, slightly overlapping the strips of Typeset DSP. Step 11: Cut your yellow It’s My Party washi tape in half horizontally to make it a little thinner. Then tear it in half length ways to get the rough ends & stick it down over the corners of the car image. Step 12: If you are using the newsprint washi tape like I did & it’s as old as mine is you might notice that some of the sticking power has gone from the back of the tape. Don’t worry just add a drop or two of the Tombow glue & you’re good to go again. Stick it down over the corners of the tool image. Viola! You have finished two cards!! Important note!! Please make sure when you are using photopolymer stamps that you place your Stampin’ Pierce Matt underneath your cardstock before you stamp your image to get the best impression from your stamps. 2 x Whisper White Thick Card Bases, cut, scored & folded. 2 x Envelopes C6 size. 3 x Assorted shape sequins in Melon Mambo from the Brights Sequins collection. The actual shape in the kit may vary from the one shown in the image. Various Stamp Blocks to adhere your Photopolymer stamps to. Step 1: Ink up the cake on the cake stand stamp using the Memento Tuxedo Black ink pad. Step 2: Stamp this image in the centre of each of the 2 inch circles of Shimmer Whisper White cardstock. Step 3: Colour in one cake using the Melon Mambo marker from the Stampin’ Write Marker Brights set, then colour the icing using the Crushed Curry Stampin’ Write Marker. Step 4: Colour in the other cake using the Crumb Cake marker from the Stampin’ Write Marker Neutrals set, then colour the icing using the Chocolate Chip Stampin’ Write Marker. Step 5: Colour both the cake stands using the Smoky Slate marker from the Neutrals set of Stampin’ Write markers. Step 6: Use your wink of Stella to add shimmer to your cake stand, candle lights & cake/icing, or wherever you choose. Step 7: Either punch each of the pieces of coloured cardstock using the Banner Triple punch or use your paper snips to trim the ends to create a banner. Step 8: Glue your Melon Mambo cardstock banner onto your Crushed Curry Banner. Step 9: Glue your Night of Navy cardstock banner onto your Cucumber Crush Banner. Step 10: Glue your stamped & coloured cake image onto the front of these. Step 11: Choose your favourite sentiments from the Endless Birthday Wishes stamp set & stamp these onto your Whisper White card bases. Don’t worry if you make a boo-boo, you can always cover it with your banners (notice how mine are in two different positions ;-)). And as some of my clever class ladies demonstrated a well placed sequin or two or three also hides any ink smudges or mishaps :-). Nothing is ever a mistake when crafting, it’s a chance to be creative & think outside the box. An oppourtunity to embellish! 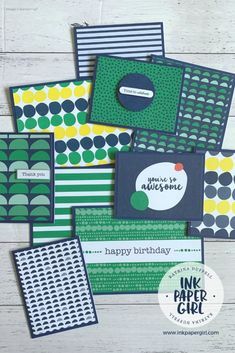 Step 12: Pop some Stampin’ Dimensionals (at least 3 or as many as you like) onto the back of each of your banners & then adhere them to your card base. Don’t forget to peel off the protective paper on both sides of the dimensional. Step 13: If you haven’t already used your sequins you can add these to your card now. I simply place a small dot of glue where I want my sequin to go & gently place the sequin on top. Don’t worry Tombow Multipurpose glue dries clear so you won’t really notice it coming through the centre of the sequins when it’s completely dry. Hooray! You have finished two more cards!! 1 x Whisper White Thick Card Base, cut, scored & folded. 1 x Envelope C6 size. 1 x Lost Lagoon Ink Pad Item No: 133644 Retiring Item!! This is part of the 2014-2016 In Colour Collection. Step 1: Ink up the swish/brushstroke image from the Sheltering Tree stamp set using the Lost Lagoon Ink pad. Step 2: Stamp this image in the centre but towards the top of the card. Stamp it again slightly lower & then again slightly lower again. You are creating a sky background for your card. Don’t re-ink your stamp between stamping, each image will be a slightly lighter version of the original. This technique is called “Stamping Off”. Step 3: Clean off your stamp & ink it up with the Marina Mist Ink pad. Repeat stamping the image as above. Step 4: Clean off your stamp & ink it up with the lightest of the blue colour’s Soft Sky. Repeat as before. Step 5: Clean off your stamp, it’s now time to add the grass part of the background. Step 6: Ink up the same swish/brushstroke image again, this time using Wild Wasabi. Repeat the Stamping Off technique that you used for the sky. Step 7: Clean off your stamp & ink it up with Pear Pizzazz & repeat the Stamping Off Technique. This is a great technique to learn. It’s really easy & it gives you almost endless possibilities for different colour combos, by varying the strength of colour each ink pad can create. Step 8: Ink up the tree image from the Sheltering Tree stamp set with your Early Espresso ink pad & stamp it onto your card. Make sure part of the tree trunk is within the green grass background & the branches are within the blue sky background otherwise your final image might look a bit strange! Step 9: Ink up your choice of sentiment from the Sheltering Tree stamp set. I chose “Thinking of You” as I wanted my card to be appropriate as either a sympathy card or a get well card or just for someone who is going through a rough patch in life. Stand back & look at how clever you are!! 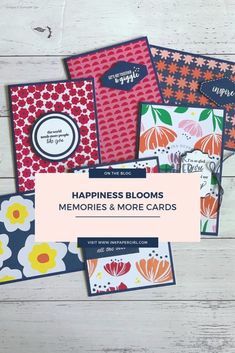 Give yourself a big pat on the back 🙂 you now have a nice little stash of cards ready to go that are appropriate for different occasions. If you would like to come along to one of my upcoming card classes but can’t make it or don’t live close by, please let me know. I currently have a couple of ladies that I post my (unstamped*) kits to & I’d be happy to do the same for you :-). What do you get in your Card Kit? Your kit will also include any embellishments that can be attached to the card, outside of the class environment. Full instructions will be available either on my blog or via email. If you would like me to print the instructions & included them in your kit I am happy to do so. This will incur an extra fee to help cover the additional costs to postage as well as printer ink & paper. *Please note that I CAN NOT send you pre-stamped images as part of your kit. This is in direct violation of the Stampin’ Up! Demonstrator Policy. You will need to provided your own Stamps & Inks to complete your cards. **Fussy cutting of images will be left for you to do as part of creating your own card. Fancy fold cards will need to be cut & scored by you as part of learning the technique.